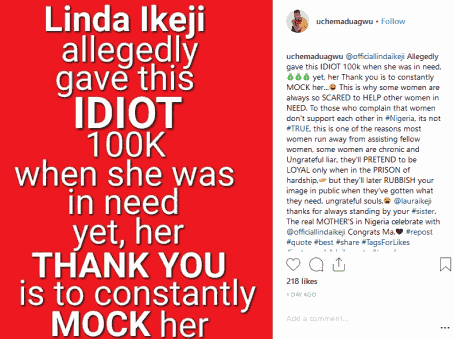 Controversial Nollywood actor Uche Maduagwu has come for Kemi Olunloyo over her recent rants on Linda Ikeji and he called her an idiot for being an ingrate. If you recollect, Kemi Olunloyo had insisted Linda Ikeji was never pregnant and her baby was carried by a surrogate mother. Uche Maduaguw however believes it is only an idiot that will receive assistance from someone and still goes online to criticise them. He wrote: @officiallindaikeji Allegedly gave this IDIOT 100k when she was in need, yet, her Thank you is to constantly MOCK her… This is why some women are always so SCARED to HELP other women in NEED.